3D Images You Can Touch! A new technology has been unveiled by Japanese firm, NTT Comware, which will allow a user to “feel” 3D images projecting from a computer screen. Without any need for awkward 3D glasses, users could feel a far-away object as if it were right in front of them, NTT said. “You would be able to take the hand, or gently pat the head, of your beloved grandchild who lives far away from you,” said engineer Shiro Ozawa. If a person linked to the system moves, his or her three-dimensional image also moves in realtime . The user would feel as if they were being pulled along if the image moves while grasping your hand. The technology depends on real-time rendering and transfer of photos, such as those of your hand when simulating a handshake. Using two cameras, the device films the hand from multiple angles. The glove worn by the user grabs the precise size and position, for optimum accuracy. This data is used to render a 3D image of the hand on the display screen. The screen used is NTT’s 3D Display – developed in 2005 – which allows users to view three-dimensional images without wearing special 3D glasses. Once the image is displayed, it sends the data back across to the glove, which processes it to provide a feeling of actual touch. So, when the user grasps the hand, the sensors on the glove pick up that data and transfer it to the image displayed, which reacts accordingly. All this, done in real time, gives a feeling of real tactile movement. Normally, a lot of museum artifacts, such as dinosaur fossils or rare paintings, are stored at a great distance. But with this new technology, the dead could also be “resurrected” by the system and museum visitors could “touch” precious exhibits sealed in showcases, the firm said. Another target for the technology is virtual classrooms, where students could feel and touch objects which are placed at a great distance, offering a new depth to the learning experience. An article in today’s NY Times highlights the growing concern of detailed mapping technology getting into the wrong hands. On the heels of the foiled terrorist plot at JFK Airport and the fact that the terrorists admitted to doing research on Google Earth, many officials are getting nervous about the improper use of this quickly improving technology. As 3dwalkthroughs.com has been predicting, it is only a matter of time before the technology incorporates very detailed 3D Walkthroughs and 3D Floor Plans into the searchable data. If not properly governed, this data could significantly increase the threat created by giving public access to this information. While we strongly believe these tools can be a valuable asset to emergency first responders, it cannot be denied that they could also be used for the wrong reasons. As a New York based company we take these security issues extremely seriously and think that the more detailed information should only be accessible by the proper authorities. We applaud state comptroller, Thomas P. DiNapoli, and his efforts to address this issue NOW, before it is too late. Makena Technologies is announcing today that it has cut a deal with Capitol Music Group to bring music artists into the There.com virtual world. The company will create a warehouse-like virtual nightclub that has a video wall on one side where visitors can view actual videos of the bands. For anyone that wants to chat with the various bands there will be a paid for VIP section that will allow for such privledges. Bands such as Yellowcard, Korn, the Beastie Boys, and Lily Allen will interact in the form of Avatars that are built to represent the real band members. Like Second Life, There.com is free, but it does charge $4.95 a month for premium service, which includes voice communication over the Internet. 3dwalkthroughs.com predicts this is just the tip of the iceberg in terms of the influx of various media formats into virtual platforms. As the ability to integrate custom 3d walkthroughs and 3d renderings becomes easier, the experience in the various virtual worlds will become more and more realistic. Imagine creating a virtual sales office using only your video Ipod. A company in Japan, Mikimoto, has made this fantasy a reality with the release of their iTheater Video glasses. 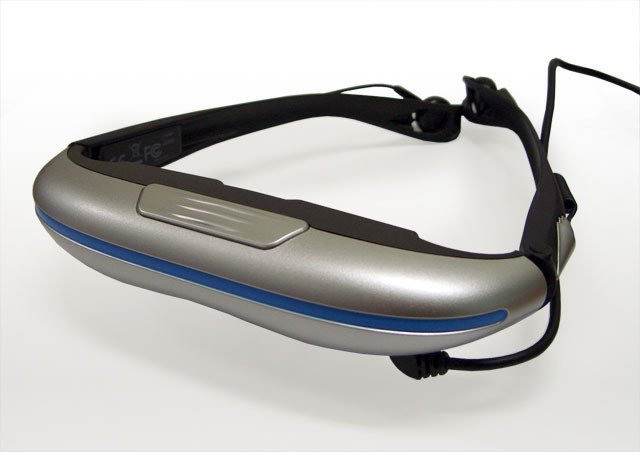 The 78g light video glasses create a 50 inch image seen from 2.5m. Besides connecting to the iPod photo and iPod video, any other video source can be connected to the Mikimoto Beans iTheater glasses. A vision from 3dwalkthroughs.com: A real estate agent or new property sales representative downloads a presentation which consists of 3D Walkthroughs, 3D Renderings and 3D Floor Plans to their iPod or laptop computer. They make an appointment to meet with a client where they sit them down in a quiet room and hook them up with the iTheater Video Glasses. The immersive experience effectively sells the property and allows the sales agent to close the deal. Clearly there would be many more steps in the process, but with direction of today’s housing market it will be these type of innovative ideas that will help make one property stand out from another. You are currently browsing the 3D Walkthroughs blog archives for June, 2007.